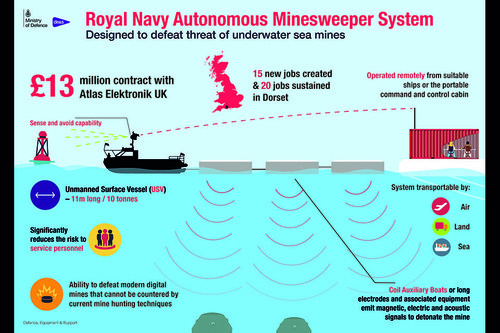 Atlas Elektronik UK has delivered the Royal Navy’s first autonomous minesweeper. The vessel is made up of three coil auxiliary boats led by a ten tonne unmanned surface vessel. The auxiliary boats can detonate mines via magnetic, electric and acoustic signals. These capabilities extend to defeating modern digital sea mines which can detect and target military ships passing above. A “sense and avoid” feature allows the vessel to work alongside other autonomous systems in order to protect the country’s territorial waters as well as those further afield. The new minesweeper has been put through a rigorous testing process by Atlas Elektronik, Defence Equipment and Support and the Royal Navy’s Maritime Autonomous Systems Trials Team (MASST). Autonomous defence projects are a big focus for militaries around the world and it is good to see the Royal Navy embracing new technologies.